So you think you may be a Book Pusher? Well, I've got some good news for you (and maybe some bad), because if you didn't know, I am a Book Pusher. I have been called a Book Pusher since my very early days of book blogging. This makes it sound like people were calling me something bad, but I love being a Book Pusher, and personally I think fellow Book Pushers should come together and form a club. Obviously, I'd be Captain, and we could constantly push books onto each other. Sounds fun, right? Anyone who tries to convince others to form a reading habit. Anyone who 'pushes' or convinces people to read certain books. The uncontrollable urge to repeatedly recommend your favorite books to people over and over and over again until they read them. 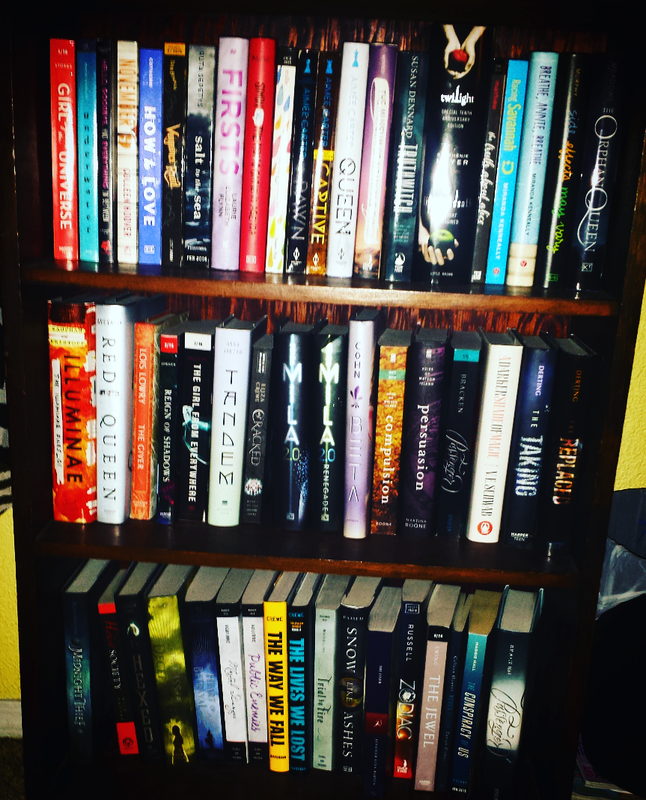 But what is life like to actually be a Book Pusher? Well, luckily for you, I'm going to tell you exactly what it is like! 1. You are constantly searching for the next book to 'push' onto everyone. This makes it sound like I'm searching for books to literally push on top of people. 2. You are also constantly in fear that you will never find another book that you love enough to want to frantically tweet at people to read it, read it, READ IT!! This seems to happen when you are in an exceptionally large reading slump. You've been forewarned. 4. You can't remember which books you've previously 'pushed' on people, and are afraid you're just saying the same books all day, every day. 6. ALL ENTHUSIASM ABOUT BOOKS 25/8. Seriously. Books are probably the only thing that I can actually show enthusiasm over. And puppies. But whatever. 8. Looking for your next victim. WHO SHOULD I BOOK PUSH NEXT? MWAHAHAHA! 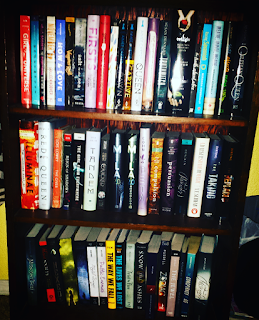 This is my mom's TBR Book Shelf. Lots of YA! She gets all the perks from me, and it's not fair! Also NOTE: She likes to read FINISHED series, so that's why she hasn't read any of the REALLY good ones yet.